Want a little added privacy and protection from wind and weather for your favorite outdoor shelter? Try this Caravan 5-foot Standard 250 Denier Polyester Sidewall. 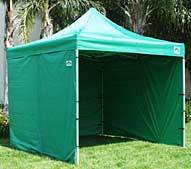 This is an extremely popular accessory among Caravan canopy owners. It's so popular because it's so simple, so affordable, and it offers so many immediate benefits. Ease of use is a key element to this product. This is an 5-foot wall that attaches easily using included Velcro fasteners to the legs and frame top of any Caravan shelter with a 5-foot wall. Once in place, it provides a convenient, secure barrier against all of those elements you'd just as soon avoid. The 100% polyester fabric it's made of is 250 denier material that is strong, durable, and weather resistant to maximize your protection. You're looking at wind, water, and UV protection, plus a fire resistant coating to prevent any unexpected accidents. If you'd like to completely enclose your canopy to create a totally private setting, you can easily do so by attaching this sidewall to other sidewalls (other sidewalls must be purchased SEPARATELY) using the convenient zippers on the wall's vertical edges. Safety, simple operation, and cost-effectiveness are elements that are on every outdoor enthusiast's minds. Certainly all of these are very important to shelter owners in particular. For Caravan owners, though, getting all of those functions is relatively simple. You can bring all of that with you on your next outdoor excursion without spending very much money by adding the Caravan 5-foot Standard 250 Denier Polyester Sidewall to your outdoor gatherings. WARNING: This product can expose you to chemicals including Diethylhexyl Phthalate, which is known to the State of California to cause cancer, birth defects, or other reproductive harm. For more information go to www.P65Warnings.ca.gov.